Activists gathered at Louisville's Big Four Bridge to voice their displeasure over the United States' intervention in Venezuela. 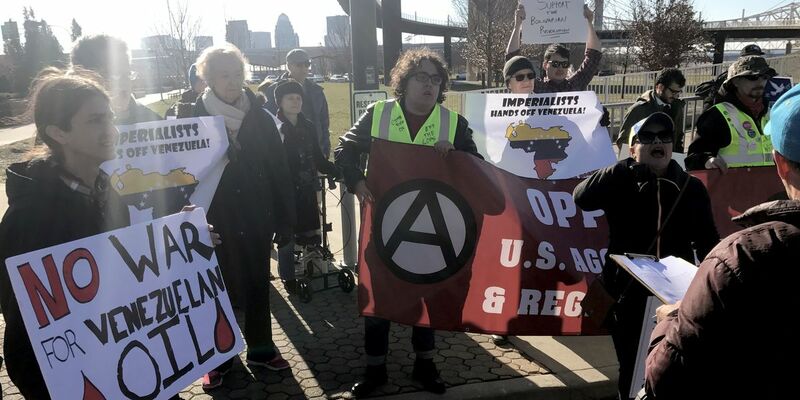 LOUISVILLE, KY (WAVE) - Demonstrators voiced their opposition to the United States’ intervention in Venezuela at the Big Four Bridge on Sunday. Similar gatherings were held across the United States as the conditions in Venezuela continue to deteriorate. Organizers of the Louisville rally said the incendiary actions of the United States--supporting the attempted coup and imposing economic sanctions, particularly on the country’s state-owned oil company--have worsened conditions for the humanitarian situation and pushed the South American country further towards civil war. They want an end to the sanctions and for the U.S. to respect Venezuela’s sovereignty, SURJ said in a press release. The group believes that the United States has gotten involved in the conflict due to Venezuela’s oil reserves, citing a quote from National Security Advisor John Bolton in their release. However, in the same interview, Bolton also cited the multiple countries standing against Maduro, who some view as a dictator, and said Maduro won’t be able to count on Venezuela’s military during the crisis. The rally was organized by the Kentucky Interfaith Taskforce on Latin America and the Caribbean (KITLAC) and Louisville Showing Up for Racial Justice (SURJ).